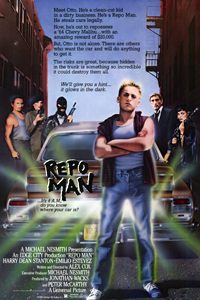 Repo Man has the type of unerring energy that leaves audiences breathless and entertained. While the title, referring to the people who repossess cars from those behind on their payments, might suggest a low-budget, gritty, realistic venture, the truth exists somewhat on the other end of the spectrum. The more conventional aspects of the script deal with an aimless young man, wonderfully underplayed by Emilio Estevez, who falls in with a crowd of repo men and takes to the 'intense' lifestyle with ease. Director-writer Alex Cox establishes the offbeat nature of the film from the start. In the opening scene, a state trooper stops a speeder and on a routine check of his trunk is blasted by a flash of light leaving him merely a smoldering pair of boots. This aspect of the story, centering on a 1964 Chevy Malibu, begins to have significance only later. The initial plot thrust involves Otto Maddox (Estevez) and Bud (Harry Dean Stanton), the veteran repo man who teaches him the ropes. However, these are certainly tame facets as a story of alien invaders evolves. The ever reliable Stanton turns in yet another indelible portrait of a seamy lowlife while Estevez registers as a charismatic and talented actor.